A friend had a high-school classmate who spent every physics class staring at the ceiling, either asleep or completely indifferent. No matter how angry the teacher got the classmate never did the least bit of work, and his attention always remained fixed on the ceiling. When the semester was over and the test results came out, the classmate scored nearly 100%. The classmate was niubi. The explanation is probably good enough to convey the concept, and the concept is not at all obscene. If you want to understand why the term is, you can follow the link; however, given the sexual nature of the obscenity, I'll trust that you will all be delicate in the comments if you decide to discuss it. One thing I find amusing is that the Chinese are apparently often too embarrassed by the term to use it in polite company, but they find that they can't do without the concept, so they just pronounce the first part of the word. That part of the word means "cow." So, someone does something cool and laid back, and you'd say, "He's so cow." Speaking of Chinese obscenities, apparently the good folks in Taiwan weren't too happy about today's op-ed in the New York Times, "To Save Our Economy, Ditch Taiwan." The Taiwanese have their own special way of expressing themselves on these points. I've been reading a bit about an attempt in Mississippi -- defeated in the recent election -- to use the law to establish that the beginning of human personhood comes at the joining of sperm and egg. This is the point of fertilization, which either is or is not the moment of conception depending on whether you consider conception to be incomplete until the zygote is successfully implanted. We will leave that debate aside for the moment. Ms. Amanda Marcotte is, of course, thrilled by the defeat of the measure; here is her analysis of why it was defeated. The other important takeaway from this is that there's a genuine disconnect between the anti-choice movement and people who identify as "pro-life" but aren't in the movement. Anti-choice activists look at polling data showing that a slight majority of Americans claim to be "pro-life" and declare victory, but what those polls really reflect is not people's genuine opinions on reproductive rights so much as the power of the anti-choice movement to cow people into cursory agreements with them out of fear of being seen as impious. In other words, saying you're "pro-life" is more about marking you as a member of a tribe, pledging fealty to your faith or to your identity as a "conservative," for a lot of people. If you dig into the Gallup numbers, in fact, it seems that on the abortion issue alone, around half of people who claim to be "pro-life" actually would like abortion services to be available in the cases they imagine that they or their loved ones could need them. I had arrived at a different conclusion yesterday, which is this: the problem with the "personhood" movement was that it draws the right ethical line, but the wrong legal one. It is perfectly correct as a matter of ethics, and even of morality, to recognize that a fertilized egg is no longer merely an outgrowth of the father or the mother; it has an independent stature that arises from its now unique DNA. This is indeed the point at which we should no longer think of it as we would the cells of one's hair or fingernails, in other words, which we can discard at will. Disposing of this has a significantly different moral quality. Nevertheless, the law cannot support the same standard. It is very often the case that ethics and the law come apart, and even that they should come apart. There are several reasons why it is a bad idea to make this a legal standard. It would invest the police with the power, and perhaps the duty, to investigate early miscarriages of the type that remain extremely common to be sure there was no foul play. This would be a mistake because it would create a burdensome and expensive new requirement for the police, which as taxpayers we should prefer to avoid; and because it would create an extremely intrusive power for the police, which we as citizens should prefer to avoid. Since almost all such spontaneous miscarriages are natural, too, we cannot imagine it would do any good to investigate them even if we wished to pay these costs in money and liberty. It would at that stage be very difficult to prove that the woman even knew she was pregnant, again raising the cost of any such investigations. In other words, it just doesn't make sense as a legal standard. It makes sense as a moral standard, but the law must be practical and enforceable, and any law must be balanced against the costs of enforcing it both in terms of wealth and freedom. As a legal standard, this fails on all counts. In less than two months, we shall see the last American military forces leave Iraq. America's mission there will be a diplomatic one from here on, although in fairness it will be a very different sort of diplomatic mission than those to which the State Department has become accustomed. It will be interesting to see how they manage it; and I suspect that many of those who served in uniform in Iraq will find their way into the service of State as "contractors" or short-term hires of one sort or another. That was how State managed its ePRTs in Iraq, chiefly through such contracts, and they will naturally want their security forces to be experienced men, with proven metal and knowledge of the country. There are probably some difficult times ahead in Iraq. Robert Stokely's convoy to visit the site of his son's death turned back, but got within two miles of the site before the mission seemed too dangerous to continue. Yusufiyah is a dangerous part of the province -- deep within the "Triangle of Death" -- but one I have visited numerous times. The roads off the MSR ("main supply route") are just the kind of roads you'd want to lay an ambush along: narrow, dirt (perfect for laying IEDs), and with areas of thick, abundant tree cover pressing on the sides of the roads. These are often palms, but also orange trees. We used to have concertina wire strung up on the edges of many of the dirt roads we intended to use often. The area is bitterly poor by our standards, but relatively prosperous by the standards of rural Iraq: this is after all Mesopotamia, where the ground at least is rich, watered by the Euphrates river. It may still be a very long time before we can visit the place the way that WWII veterans used to go back to France or Germany, to see the old sites as they shine in the glowing light of peace. I hope to visit Iraq someday on those terms, because it is in its way a beautiful country -- a very different kind of beauty than what you would expect, and one that can be hard to see between the war and the poverty. Still, it is, if you have eyes for it. Charles M. Schultz, if he were alive still, would have drawn Snoopy drinking root beer at Bill Mauldin's house today. He once did a movie about the Peanuts kids going to France. Mostly it was a movie for kids, although it included some clever references to French history. The place that Charlie Brown is sent to visit is called "Le Chateau de Malvoisin," the Castle of the Bad Neighbor -- but Malvoisin, "the Bad Neighbor," was the name of the massive trebuchet built by Philip II's army during his joint crusade with Richard the Lionheart. There was one scene in that Mr. Schultz included in memory of those from World War I, as well as his own war. He served as an NCO and a .50 cal gunner in the 20th Armored Division during WWII. The question is one that remains relevant. I suspect it always will. Happy 236th birthday to the United States Marine Corps. Semper Fidelis: you always have been. There's more than one kind of dulcimer, but we have them both here where I grew up. The first is the hammered dulcimer, an instrument known around the world in various forms; the other is the Appalachian dulcimer, or mountain or lap dulcimer, which is a stringed instrument played across the lap. The hammered dulcimer has the strongest sound. Here's an example of a Gospel tune being played by a student at East Tennessee State University -- where, as it happens, both my mother and father went to school. The instrument is medieval, at least, and so we see it in other forms. The Appalachian dulcimer seems to be a simpler form, which comes from a poorer culture that tried to maintain the instrument with less wealth and technical skill. It still manages to do some interesting things, but the character of the instrument is entirely different. Let's try a more direct comparison, and one more to the advantage of the mountain instrument. The instrument is featured in this piece as well, although it is played but little. Still, the piece itself is worth hearing through. Many of you will recognize the song they are singing in that last link. This is the fate of all of us, if we don't square up. But America will do better, right? Well, perhaps; but tonight's elections show Ohio voting against restrictions on unions, and re-elections of incumbents across the board. It may be that reason shall not save us, even with glowing examples before us; and therefore, we shall have the fire as well. Popular physics has enjoyed a new-found regard. Now comes a brave attempt to inject mathematics into an otherwise fashionable subject. From most people, I would dismiss this as mere anti-capitalist rhetoric. From Nassim Nicholas Taleb, it's an idea we ought to consider carefully. He understands the banking and finance systems quite well, and especially he understands what their limits are. Dr. Mead has a post that I'm sure you've seen elsewhere, on the clash between factions within what he calls the Blue Model. I'd like to discuss one particular element of his piece. Blue Wall Street benefits much more from the blue social model than the other elements in the coalition. Five figure cop salaries and low six figure salaries for goo-goo social engineers pale before the seven, eight, nine and ten figure paydays on the Street. There is a direct connection between those big paydays and the connection between big finance, big government and Democratic (as well as Republican) interest group politics. Good relations with politicians help make money: ask the leadership of Goldman Sachs, which has provided much of the leadership and policy advice for administrations of both parties for some time. It’s a sensible trade-off for well connected i-bankers to accept higher general tax rates in exchange for significant influence over government policy. You can not only use that influence to carve out nice loopholes that insulate you from the high tax rates blue policies entail; you can get enough business from good government relations to offset the cost of the taxes the model requires. If Al Gore’s environmental businesses make enough money as a result of emission laws and price controls, he doesn’t have to worry too much about his tax rate. And in any case, carbon taxes favor the financial economy (which uses very little carbon though its PR firms emit a lot of hot air) over the manufacturing economy. The Red Model is on display in Texas, where Gov. Perry has favored corporate interests. Consider tax rates: Texas has no corporate income tax rate, but only a 'franchise' tax on net profits over a million dollars, at no more than one percent, with the profits to be calculated according to the most favorable of four methods. Education is another area in which Texas favors the interest of corporations, with its curricula designed around developing a workforce rather than a citizenry. A free republic needs a citizenry educated in history, some of the great works of literature, certain works of ancient philosophy, as well as math and science; a workforce can dispense with everything except the math and science. Gov. Perry has pushed to find ways to generate more focus on those workforce-developing methods. I don't say this to attack Gov. Perry, who may be the best of the remaining candidates in spite of his participation in crony capitalism. I say it to point out that we've already reached a Presidential field that is going to endorse some form of crony capitalism. Mr. Cain is a Red Model capitalist, who just last week was boasting of his ties to the Koch brothers; Gov. Perry is a well-known one, who took some heat from Rep. Bachmann in the debates over it (she was probably the last chance to avoid a crony capitalist of some flavor, but alas). President Obama is a Blue Model exemplar. Mitt Romney is also from the Blue Model, as demonstrated by his policies and positions as a governor up north. What is really at stake in this election is whether the Presidency will be occupied by a Red Model crony or a Blue Model crony. The Red Model offers two things to the people that the Blue Model does not. Employment, and a model that is sustainable. The Blue Model is permanently broken, as Dr. Mead has pointed out repeatedly and excellently in recent months. Despite being oil-free, South Dakota’s unemployment rate is around one-half the national rate. Its economy is booming. Why? When I talk with business leaders around the country who have facilities in South Dakota or who deal with businesses there, they invariably emphasize the quality of South Dakota’s labor force. The phrase “work ethic” comes up again and again. And, of course, South Dakota has a friendly business climate. It hasn’t elected a Democratic governor since 1974. And there isn’t a union in sight. "Work ethic" isn't something the government can train the citizenry to have, but it is something that the government can break via perverse incentives. What the Blue Model advocates may have to accept is that a Red Model is the last means for producing enough wealth to transfer to other, preferred outcomes -- things like social services. Even then these will have to be cut, because even if you entirely eliminated the Defense Department, we are facing massive shortfalls. Of course, an improved economy will increase the amount of revenue available, so the Red Model can help; but the Blues are going to have to face up to the internal fractures that Dr. Mead describes, and decide between police unions and welfare as the trolly winds down. None of this is finally satisfying, but as a practical matter it's where we are. We shall face the next four years with some sort of crony capitalist in office; we must decide which kind. Those of us who would prefer to build a citizenry rather than a workforce, or an economy built around small businesses and farms -- that Jeffersonian model favoring the private ownership of individual means of production -- we will not see any joy out of the next President. Still, there is bad and there is worse, and it may be that the bad is not entirely without its silver lining. This story shows that -- in spite of decades of 'contract theory' approaches to marriage -- a substantial part of the public still has at least a vague understanding of what marriage really is. "In its purist form, marriage is about starting a family, and I wanted to start that family with the same name," she said. "Eventually it came down to practicality and what felt right." Like Rogers, an overwhelming majority of all brides drop their surnames, according to the Lucy Stone League, named for a woman who refused to take her husband's name in 1855. Another survey, published last spring in the journal Gender and Society, finds that at least half of those queried said they would agree that a name change should be a requirement for marriage. "It absolutely shocked us," said co-author Brian Powell, who is a professor of sociology at Indiana University. Powell surveyed 815 Americans of all genders and educational and economic backgrounds, asking them if they "agreed" or "did not agree" with certain statements on views of family. More than 70 percent of women said they agreed that a woman should change her name at marriage. And half said "yes" when asked whether making the name change a state law was a good idea. Marriage is a kinship bond uniting bloodlines across generations. The sense that this is not about one's own personal identity, but about forging a new family, is a very healthy and correct instinct. Exactly how names are aligned is less important than that this sense is maintained -- and indeed, the study shows that something like a majority would support the groom taking the bride's name. Catholics are least likely not to change their names, followed by Protestants and Jews, but that the overall rate of non-changing is only 18%. Tellingly, gay men who choose to pursue "gay marriage" tend to keep their own names -- pointing clearly to the fact that something other than the forging of a new kinship bond is at the core of this practice. Interesting stuff. I have very little by way of an opinion about whether or not a woman ought to take the name of her husband. The foundation of marriage is a matter that is of interest to us all, as the foundation of marriage and family is the foundation on which any civilization stands -- if it does. Just kidding. Asteroid 2005 YU55 is projected to pass tomorrow within the Moon's orbit, about 200,000 miles out. That's pretty close, but too far to do any harm. This asteroid is about as big as an aircraft carrier. If it hit, it might result in a 4,000-megaton blast, a 7.0 earthquake, and (if it struck water) 70-foot-high tsunamis in the very immediate vicinity. An impact of that kind is estimated to be about a 100,000-year event. 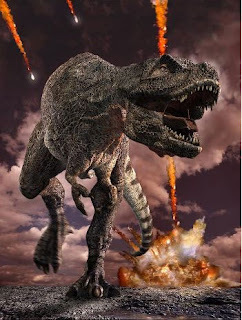 In contrast, the 65-million-year-old K-T boundary "dinosaur killer" probably was 5 or 10 miles wide, and that is considered about a 100-million-year event. One of my favorite scifi stories is "Lucifer's Hammer," a TEOTWAWKI fantasy about a comet strike. Asteroid guru Jay Melosh of Perdue University adds that "Apophis, a similar-sized asteroid about one-third of a mile in diameter, is the biggest threat in our near future. It has a tiny chance of striking the Earth in 2036." Yeah, that's what they said in Lucifer's Hammer. It's always a tiny chance until it happens! 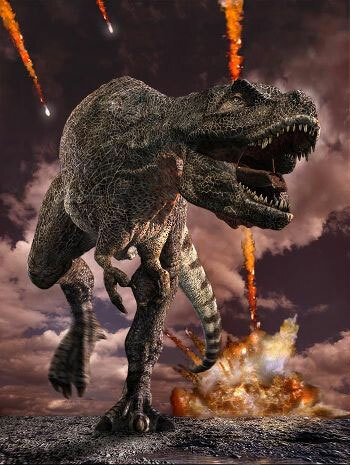 Nevertheless, although an object of that size might wipe out a big city, it probably wouldn't lead to any extinctions. I took to the road this weekend. Most of it was spent in the mountains. Above five thousand feet the leaves are almost gone, but in the valleys of the Nantahala and Chattohoochee forests are still filled with leaves of grand color. While near the Pisgah National Forest, I stopped in to see the harper whose work we looked at last week. She turns out to be a perfectly delightful young lady named Sarah Marie Mullen, who was thrilled to have one of her original compositions requested. She proves to have degrees in Anthropology and Biology as well as music. She tells me that different regions have different ways of tuning a harp to make the characteristic sounds of the region's music. As harpers tend to learn from each other, however, these different ways meld a bit over time, so that characteristic cultural sounds tend to borrow from those others who are closest to them. As a result, it is possible to start in Ireland and work your way to Eastern Europe song by song, retuning the harp just a little bit at a time as you pass through each culture. So you can play an Irish or Scottish song and quickly then play a French one, and then quickly a Spanish; but to go from even Eastern Europe to China would require taking a long time to retune each string on the harp. At one point she was playing a Spanish tune, a flamenco, and at the end of it she said to the audience, "Excuse me." She unplugged the harp from the amplifier, and while we sat there she quietly replayed the piece from the beginning. "I made a mistake," she said, "but it sounded great, and I wanted to be sure I would remember how to do it again!" I thought that showed a fine dedication, but it also suggests a link between music and biology. You might say it is an instance of a random mutation, but one that proves to have advantages: and so it will survive and, perhaps, come to be reproduced by others who encounter it. There is a sense of unity between the arts and the sciences, which is right as the True and the Beautiful are at last only parts of the Good. Her website is here: let me recommend her work for any of you thinking of musical gifts this year. Aside from the stop to hear some beautiful music, the trails and the forests offer their usual refuge. Camping in the national forests is lawful in a dispersed fashion, and free. A trail through mountain laurel. A ridge west of Asheville. The bluffs on the border region of Georgia and the Carolinas. I trust you all had a fine weekend as well. Well, why shouldn't a machete be a kitchen knife?